Ingredients: Refined Wheat Flour, Molasses, salt, Green Gram, Cardamom, Sesame and Vegetable oil. This is to declare that the Sukhiyan are prepared by the following procedure. First mix together the cooked green gram with Molasses powder/liquid Clean the cardamom by removing its skin and grind it. Mix the cardamom powder with the above mix of green gram and Molasses. Make small balls and keep them separately. Make a paste of refined wheat flour adding very little salt and water. Heat a frying pan and add Vegetable oil to it. 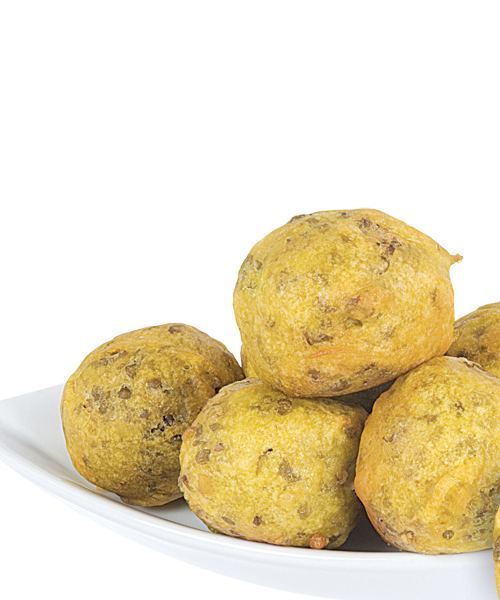 Dip the green gram ball in the paste made with Refined Wheat flour and deep fry it in the hot boiling oil. When the balls turn golden in colour, take it out from the pan and let it cool a little.